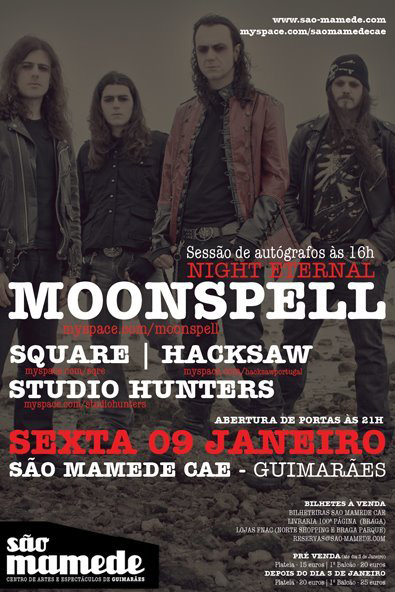 Portuguese metallers MOONSPELL will take part in a signing session prior to their January 9, 2009 concert at São Mamede CAE in Guimarães, Portugal. The event will begin at 16.00h. Video footage of MOONSPELL's December 19, 2008 concert in Munich, Germany can be viewed below (clip uploaded by "eblinternational"). MOONSPELL released its long-awaited new DVD, "Lusitanian Metal", earlier this month in Europe via Century Media Records. The first disc features one complete live show recorded live in Katowice in 2004, all video clips (from "Opium" to "Everything Invaded"), an in-depth interview with all current band members and a detailed discography. The second disc offers a historical overview of the Portuguese metal group's period as a Century Media recording artist, with no less than 50 live tracks, starting with some very old-school live rehearsal recordings back in 1992 and ending with live footage from the "Spreading The Eclipse Tour". "Lusitanian Metal" is available as luxurious limited-edition kingsize mediabook with both DVDs as well as a CD with the complete Katowice show as well as a standard 2DVD in a super jewel case. The CD included in the limited edition is also available separately. The band's latest album, "Night Eternal", entered the national chart in Portugal at No. 3 and in Germany at No. 62. The follow-up to 2006's "Memorial" was recorded at Antfarm studios in Denmark with producer Tue Madsen (THE HAUNTED, DARK TRANQUILLITY, HALFORD). Two editions of the record were made available: A limited double digipack with different artwork, one bonus track ("Age of Mothers"), a different version of the song "Scorpion Flower", the full album as well as a bonus DVD containing all video clips from "Memorial" plus "Finisterra" "making-of" footage and three live clips from last year's performance at the Wacken Open Air festival in Germany; plus the jewel case edition.